Here at the Jam Tree, we love to throw a party! So whether you’re looking for a casual dinner with friends, to something more formal; corporate event management, or an area for drinks – we can cater to any budget and size of operation. Our dedicated Events Team are here to help take the hassle out of planning your get-togethers, so call us today to get the ball rolling. We are also happy to accommodate any dietary requirements and write bespoke menus on request. 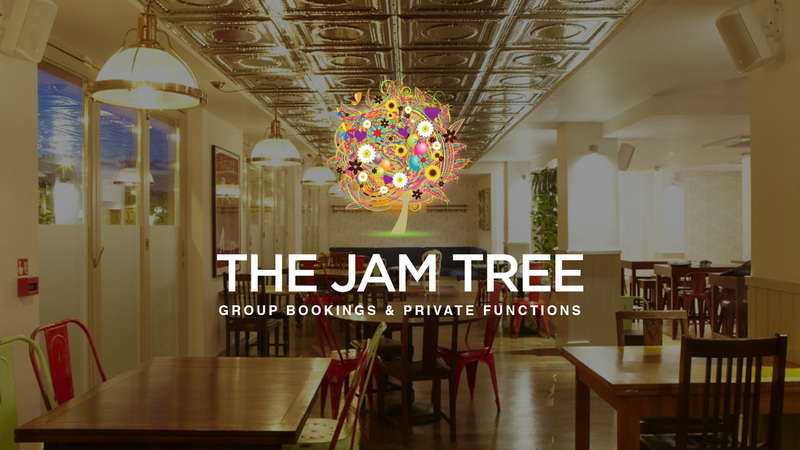 Get in touch with Gabi on 0203 397 4422 or email clapham@thejamtree.com to discuss your requirements, or make an enquiry online using the form on this page and one of the team will contact you. A large and airy room, lined with floor to ceiling windows, our central bar is ideal for a buzzy celebration. We have soft seating as well as tables suitable for Christmas dinners of all sizes. You can also try our fabulous cocktails from our extensive list and spirit collection. The Bookcase Room is ideal for private hire – the perfect place for a private party or celebration as it allows you exclusive usage of the area. There’s an independent bar, a mixture of dining tables and soft seating, as well as the possibility of using our Ping Pong table. Options for personalising your event include making your own playlist and usage of our overhead projector. We suggest the Bellini Reception to set your party off with a bit of a sparkle! Additional Details: Saturday brunch exclusive hire is not available. Our magical garden is fully covered and heated throughout the Winter months. It’s perfect for a fun drinks party or dinner with your nearest and dearest. Illuminated by fairy lights, you can cosy-up under our blankets and cushions – keeping you nice and toasty. Surrounded by trees and luscious planting, you can immerse yourself in a winter wonderland.